Inferior alveolar nerve (IAN) dysesthesia after endodontic therapy is a rare and important complication, greatly influencing patients' quality of life. IAN injury can be categorized as mechanic, thermal, or neurotoxic damage. Swift and adequate therapy is essential to restrict nerve damage. Nerve damage results in a partial or total loss of sensation or dysesthesia in its innervation zone. Risk factors for overfilling include a close relationship of the root to the IAN, use of highly fluid thermoplastic fillers, immature root formation, or lack of apical constriction. The following cases focus on IAN damage due to endodontic overfilling in the mandibular molar/premolar region and its management in an academic hospital. A 49-year-old female presented to our emergency department with unbearable toothaches, steadily increasing since root canal treatment in an endodontic specialist center 4 days earlier. It concerned a left mandibular second premolar, with a root length of 26 mm. 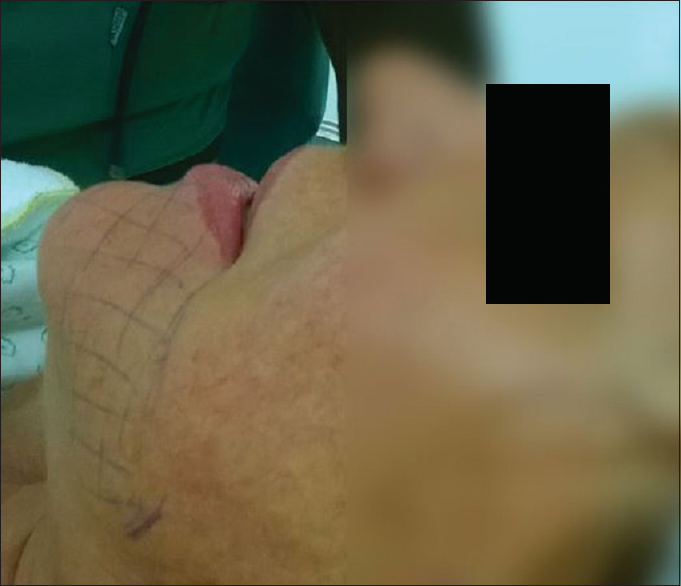 The patient was told discomfort could last a few days, due to proximity to the mandibular canal. The day after, a new severe painful sensation developed in the left mandible. During review at the endodontic clinic, the patient was assured, the pain was not abnormal, and she was advised to wait for another 14 days, without further examination. Reaching unbearable pain levels 4 days after initial treatment, an on-call dentist was visited. 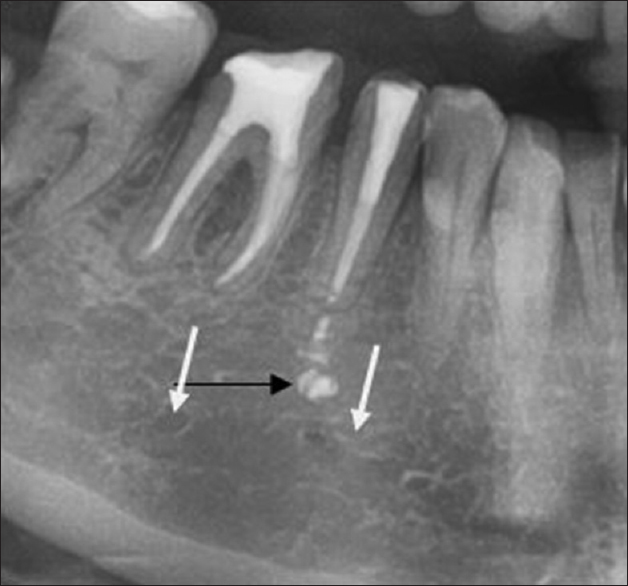 Periapical radiographs revealed radiopaque material extending from the premolar root canal into the mandibular canal [Figure 1]. The patient was promptly referred to our Department of Oral and Maxillofacial Surgery. Clinical presentation revealed local pain as well as an anesthetic area [Figure 2], in which occasional dysesthesia (“electric shocks”) was described. 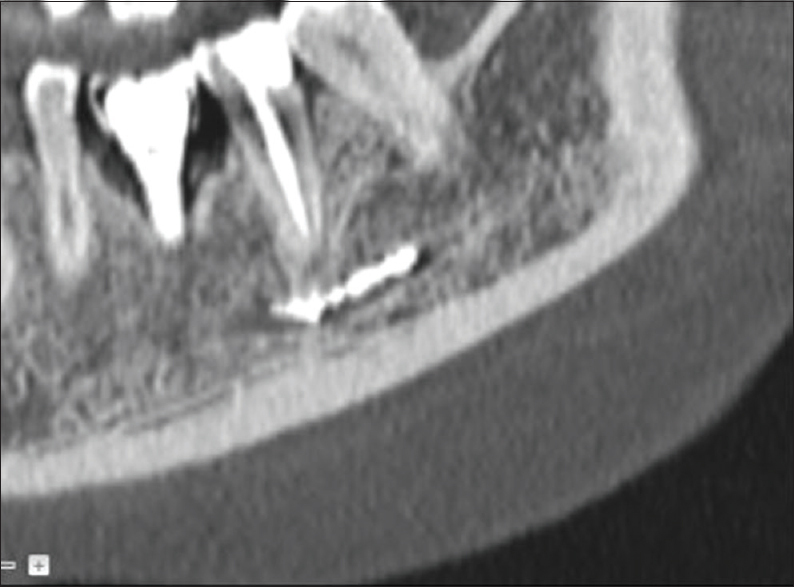 A cone beam computed tomography confirmed the presence of a radiopaque foreign body in the mandibular canal with a length of 13 mm, just posterior to the mental foramen [Figure 3]. Using the piezotome, our staff member made an osteotomy window, visualizing the contents of the mandibular canal. Penetration of the IAN with endodontic material was revealed [Figure 4]. The apical area of element 35 was resected. Careful removal of all foreign materials was followed by extensive rinsing of the area with sodium chloride 0.9%. After removal of the trabecular bone layer, the bone flap was repositioned and fixated with two titanium miniplates and cortical screws. Pain and dysesthesia decreased shortly after surgery. Medicamentous therapy included corticosteroids to suppress swelling, pregabalin 75 mg twice daily, primaner once daily, and suppletion of vitamins B1, B2, B6, and B12 (oral BefactForte and intramuscular Neurobion 100 mg). Within 6 weeks, pain levels diminished to a mild discomfort and medical therapy was discontinued. Seven months after surgery, a reduced 2-point discrimination persisted, remaining unchanged after 18 months. Since the chance for nerve regeneration 18 months after injury is very limited, a nerve transplant was discussed. A 54-year-old female known with type 1 diabetes was referred to our Maxillofacial Department 11 months after endodontic treatment of the mandibular second premolar and first molar. Immediately following endodontic treatment, a fierce and increasing pain emerged. Despite revision of endodontic treatment on both elements, a nagging pain at the right side of the mandible persisted, irradiating to the ipsilateral neck and shoulder region. On presentation, the pain had been continuously present for 11 months. Radiologic imaging revealed an additional quantity of endodontic filling material infra-apical to the second premolar. Although located close to the IAN, the filling material did not invade the mandibular canal [Figure 5]. As mechanical nerve damage was deemed unlikely and the pain had been present for 11 months already, conservative pharmacological therapy using amitriptyline 10 mg once daily was proposed. Three months later, the patient reported less pain and declined further follow-up. 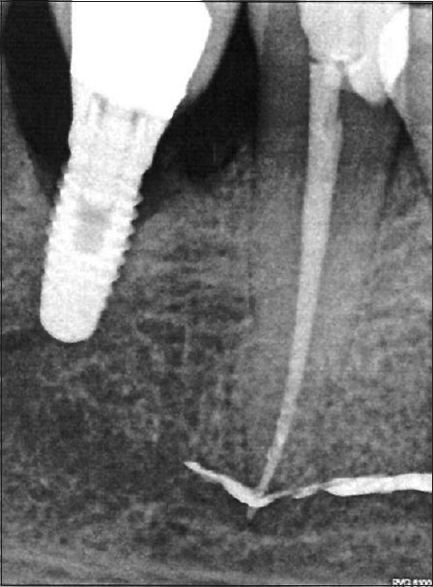 Overinstrumentation and overfilling are major causes, of which the incidence can be limited by preprocedural apical radiographs and electronic length determination during treatment. Furthermore, neurotoxicity is documented in nearly all materials used in root canal treatment. The caustic effect of calcium hydroxide or heat released during filling with gutta-percha are further hazards for nerve damage. Classification of the products in sealers, root canal irrigants, and paraformaldehyde-containing pastes has no clinical importance. The extent of nerve damage is primordial as local or mentalis dysesthesia can linger on for months, even after decompression.,,,,, A pierced or torn IAN, as seen in the first case, has been described sporadically though its effect on long-term residual nerve damage remains unknown. This article intends to increase awareness in the dental community for prompt referral after iatrogenic anesthesia/dysesthesia following endodontic treatment, which can benefit affected patients. The authors certify that they have obtained all appropriate patient consent forms. In the form, the patient has given consent for her images and other clinical information to be reported in the journal. The patient understands that name and initials will not be published and due efforts will be made to conceal identity, but anonymity cannot be guaranteed. Smith JG, Elias LA, Yilmaz Z, Barker S, Shah K, Shah S, et al. The psychosocial and affective burden of posttraumatic neuropathy following injuries to the trigeminal nerve. J Orofac Pain 2013;27:293-303. Ahonen M, Tjäderhane L. Endodontic-related paresthesia: A case report and literature review. J Endod 2011;37:1460-4. Gallas-Torreira MM, Reboiras-López MD, García-García A, Gándara-Rey J. Mandibular nerve paresthesia caused by endodontic treatment. Med Oral 2003;8:299-303. González-Martín M, Torres-Lagares D, Gutiérrez-Pérez JL, Segura-Egea JJ. Inferior alveolar nerve paresthesia after overfilling of endodontic sealer into the mandibular canal. J Endod 2010;36:1419-21. Mohammadi Z. Endodontics-related paresthesia of the mental and inferior alveolar nerves: An updated review. J Can Dent Assoc 2010;76:a117. Lampert RC, Nesbitt TR, Chuang SK, Ziccardi VB. Management of endodontic injuries to the inferior alveolar nerve. Quintessence Int 2016;47:581-7. Marques TM, Gomes JM. 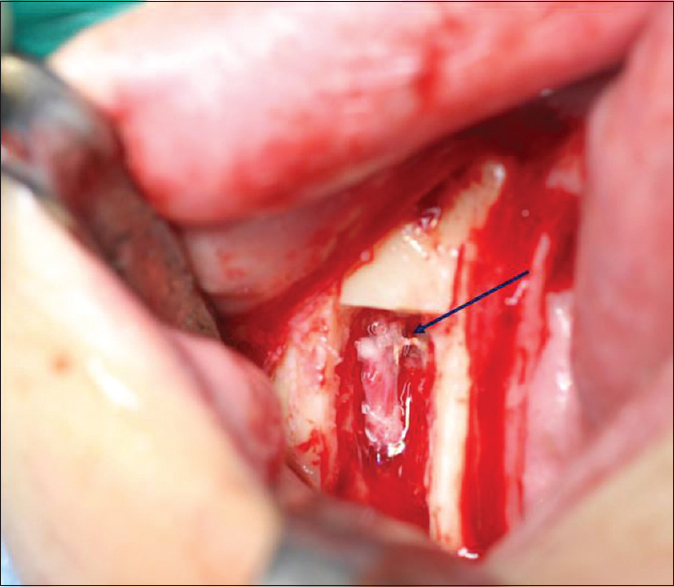 Decompression of inferior alveolar nerve: Case report. J Can Dent Assoc 2011;77:b34. Scolozzi P, Lombardi T, Jaques B. Successful inferior alveolar nerve decompression for dysesthesia following endodontic treatment: Report of 4 cases treated by mandibular sagittal osteotomy. Oral Surg Oral Med Oral Pathol Oral Radiol Endod 2004;97:625-31. Renton T, Yilmaz Z. Managing iatrogenic trigeminal nerve injury: A case series and review of the literature. Int J Oral Maxillofac Surg 2012;41:629-37. Zuniga JR. Surgical management of trigeminal neuropathic pain. Atlas Oral Maxillofac Surg Clin North Am 2001;9:59-75.